The Newmarket Handicap is one of two Group 1 feature races on the ‘Super Saturday’ race card at Flemington Racecourse in March during the Melbourne Autumn Racing Carnival. Held at the same meeting as the Group 1 Australian Cup (2000m), the Newmarket Handicap is an elite level sprint run down the famous Flemington straight of 1200m. It offers $1.25 million in prize money and as the name suggests is contested under handicap conditions. Many of the season’s top sprinters come into the Newmarket Handicap via the Black Caviar Lightning Stakes held at the same track over 200m shorter the month before, with former champion sprinter Black Caviar (2011) the last to do the double before the historical win by Redkirk Warrior (2018) who also saluted in the Newmarket Handicap results in 2017. The latest edition of the Newmarket Handicap ran on Saturday March 9, 2019 . The official Newmarket Handicap results 2019 and finishing order will be published below when the race runs on Saturday March 9, 2019 . 2016 Newmarket Handicap winner The Quarterback scored an upset at odds of 20/1. Photo: Ultimate Racing Photos. With nominations for the sprint out over a month before race day the early Newmarket Handicap odds provide punters with the chance to lock in their all-in selections on the classic before final acceptances are out. Favourites in Newmarket Handicap betting have an impressive record in the race with six of the 13 punters’ picks saluting from 2007 – 2018 the most recent of which was Hay List (2012). Top class sprinters with proven Group 1 winning form usually dominate the Newmarket Handicap odds as do those coming out of the Black Caviar Lighting Stakes and Oakleigh Plate. The Newmarket Handicap 2019 betting markets will be listed below as soon as odds are out on the Group 1 Flemington sprint down the straight this autumn. The Newmarket Handicap field attracts the autumn’s best sprinters and usually attracts a high number of final acceptances. The line-up for the Newmarket Handicap is often a similar field to that of the Group 1 Black Caviar Lightning (1000m) run at Flemington in February. The Black Caviar Lightning Stakes is the most popular lead-up into the Super Saturday Group 1 providing five Newmarket Handicap winners from 2012 – 2018 including Black Caviar (2011) and Redkirk Warrior (2018) who completed the double. The other race producing the most Newmarket Handicap winners is the Group 1 Oakleigh Plate (1100m) at Caulfield a fortnight before, a double last completed by Lankan Rupee (2014). Newmarket Handicap First acceptances are then taken in late February before the final Newmarket Handicap field is released on the Tuesday before the race. The official Newmarket Handicap 2019 Nominations are taken in late January and often attract over 50 sprinters. Newmarket Handicap tips are often dominated by the season’s top three-year-old sprinter with the youngsters boasting a good record over the older horses in this race. Six of the 12 Newmarket Handicap winners from 2004 – 2015 were three-year-olds including the Chris Waller-trained Brazen Beau (2015). 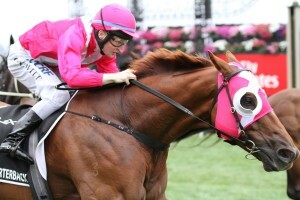 The best runners out of the Black Caviar Lightning Stakes and Oakleigh Plate are also top Newmarket Handicap tips with those two lead-up Melbourne sprints producing all nine winners from 2008 – 2016 before Redkirk Warrior made history in 2017 winning first-up for the first time in 100 years. Redkirk Warrior returned to defend his title in 2018 on the back of a Lightning Stakes lead-up win. A wide barrier doesn’t prevent a class sprinter from making a good Newmarket Handicap tip either with three of the four winners from 2012 – 2015 jumping from double digits including Lankan Rupee (12 in 2014). The top Newmarket Handicap 2019 betting tips and exotic Flemington race selections will be available below from the Ladbrokes’ tipsters the week of the race so stay tuned for the sprinters to get behind in the straight track Group 1 this autumn. Looking at all the information provided in the Newmarket Handicap form guide is a great way to narrow down the winning chances of the top sprinters in the field. Things to look for in the form include last start winners and runners-up in the Lightning Stakes and Oakleigh Plate, horses with proven straight track form and previous Group 1 winners. The Newmarket Handicap form guide also shows the jockeys, trainers and barriers of all runners and the most successful gate in the past 30 years is barrier 7; although down the Flemington straight barriers are of less importance than good lead-up runs. A link to our comprehensive Newmarket Handicap 2019 Form Guide will be provided below the week of the race. While favourites have a strong record in the famous sprint upset Newmarket Handicap results often occur also including Shamexpress ($15 in 2013), Wanted ($13 in 2010) and Scenic Blast ($13 in 2009). More recently there have been a number of really notable blow-out Newmarket Handicap winners including The Quarterback ($21 in 2016) and Redkirk Warrior ($31 in 2017). The longest priced Newmarket Handicap winner in the past quarter of a century was Mookta ($34 in 1994). The Newmarket Handicap results also show the full finishing order of the entire field, winning times, margins, jockeys and trainers. Notable recent Newmarket Handicap winners include Redkirk Warrior (2017 & 2018), Brazen Beau (2015), Lankan Rupee (2014), Hay List (2012), Black Caviar (2011) and Weekend Hussler (2008).